One of the bestselling writers of all time, Terry Pratchett has created a literary juggernaut in the immense Discworld series, a world so complex that virtually any story can be told. With popular characters such as Commander Sam Vimes of the Watch, Moist von Lipwig, Death and his granddaughter Susan, Granny Weatherwax, Lord Vetinari and many others, Pratchett’s Discworld series mix comedy, fantasy and a fair bit of satire. Whether you’re a newcomer to Discworld or you bought ‘The Colour of Magic’ back in 1983, the following links are ideal for anyone trying to get a fix of Anhk-Morporkian magic between books. The best place to start is undoubtedly Terry Pratchett’s website, a wonderful collection of articles, event updates, a discussion forum and news about upcoming books from Terence David John Pratchett, OBE. In times past, Pratchett himself would write pieces for the site but these don’t seem to come along so often these days, probably due to his busy work schedule and his illness (the 66 year old was diagnosed with early-onset Alzheimer’s disease in 2007). Earlier this year he was forced to cancel a convention appearance due to problems with the disease, and it seems that future books from the great man may be limited in number. Fortunately the site is well managed and the success of Pratchett’s books suggests it will continue beyond his retirement. More than just a shop, the Discworld Emporium is also an online community and news page, with a popular, busy discussion forum, a great place to find and chat with other fans of Pratchett’s amazing library. What is probably most notable is that this isn’t just a website – the Discworld Emporium is an actual bricks and mortar store in Wincanton, Somerset in the south west of England, around 120 miles from London. While the online shop isn’t huge, it does feature a lot of unusual items that Discworld fans will enjoy. What it doesn’t offer, however, are the live-action TV adaptations of ‘The Colour of Magic’, ‘Hogfather’ and ‘Going Postal’, and the animations of ‘Truckers’, ‘Wyrd Sisters’ and ‘Soul Music’, but you’ll find these all on Amazon, along with the various editions of the Discworld books. No space on your bookcase? Pratchett’s books are also available for Kindle, so you can enjoy them on your PC Kindle For PC Proves That You Don’t Need A Kindle To Enjoy Books From Amazon Kindle For PC Proves That You Don’t Need A Kindle To Enjoy Books From Amazon Being the voracious reader that I am, a library was always a small hillock to conquer. Thanks to the eBook revolution that has swept over us now, we now have peaks to scale. One of... Read More or any smartphone or tablet device. Discworld is huge. Situated on the back of four unfeasibly large elephants, each standing on the shell of Great A’Tuin, the star turtle, it has a long, detailed history and a bustling city state Anhk-Morpork, where the majority of the stories take place. So detailed are Pratchett’s books – incidental characters are so well drawn that they later get their own stories – that keeping tabs on every personality and event in Discworld is incredibly difficult. 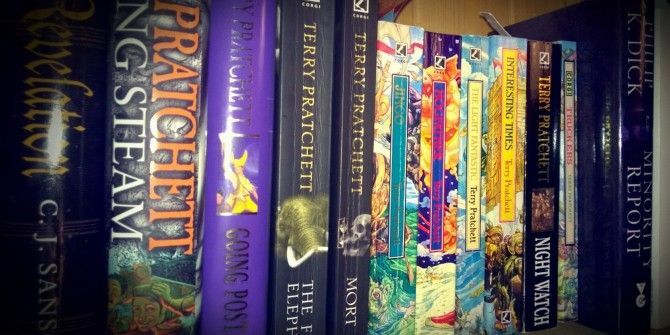 Other than rereading all 40 books, the best way to refresh your memory and find out more about various characters and events is to head to the Discworld and Terry Pratchett Wiki. Be careful, however – you don’t want to spoil any surprises! You’ll also find an awful lot of Discworld references on Wikipedia, starting off with this detailed history of the series. If TV adaptations, audiobooks, radio dramas and the books themselves aren’t good enough to immerse you in Discworld, you should probably try one or two of the games based on the series. Information about video games and board games (including card games and a GURPS title from Steve Jackson Games) set in Discworld can be found at The L-Space Web. Finally, it’s worth mentioning that there is a very good newsletter that you can subscribe to at www.discworldmonthly.co.uk, which as the name suggests arrives monthly in your inbox. Each issue is full of news from the world of Terry Pratchett, including information about new editions, adaptations, local meetings, reader’s letters (emails), games and puzzles, reviews, and more. Better still, if you missed a copy, you can catch up and read the back issues all the way back to May 1997! As someone who has been subscribing to email newsletters since the mid-1990s, this is among the very best that I have encountered, with a consistently high quality. Basically, if you’re a Pratchett and Discworld fan, you should have already subscribed, so get a move on! What’s Your Favourite Discworld Link? We’re merely scratching the surface of Discworld’s online existence with these links. If you’re a fan you’ll probably have visited these resources already. You might even have some of your own. What did we miss? Which links did you enjoy?